Ch’io mi scordi di te? Grimaud does Wolfgang. 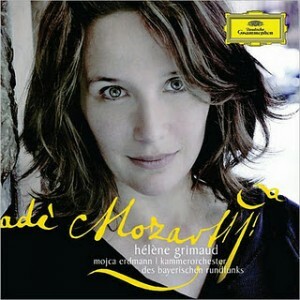 The Adagio from the Piano Concerto in A major K. 488 is one of Mozart’s most magically inspired movements and for Hélène Grimaud it is possibly the most sublime movement that he ever wrote for the keyboard: “Even if this movement were all we had, that would be enough.” It must remain an open question whether Mozart regarded the key of F sharp minor – an extremely unusual one for him – in the same way as his contemporary Daniel Schubart, who defined it as “a dark key that tears at passion as a vicious dog tears at your clothing”. But even if there is no doubt that Mozart was repeatedly inclined to conceal his true feelings behind a mask, Hélène Grimaud is convinced that he did not do so here in this profound, inward and heartfelt movement. ​There is no doubt that this is one of the most beautiful arias that Mozart ever wrote. The way he sets up a relationship between voice and piano and allows each to react to the other is unique in the whole of his output. One is almost tempted to hear in it a secret declaration of his love for Nancy Storace, his first Susanna in Le nozze di Figaro and the singer for whom he wrote this scena and rondo. He himself played the keyboard at the first performance in 1787. The aria is marked Rondo, a form that was fashionable at the time in vocal composition. The beginning Andante segment is actually in ternary form and is introduced by the orchestra. The central, contrasting section begins at “Tu sospiri?” and modulates to the dominant. After the return of the soprano’s opening lines, Mozart prepares for the shift to the faster, second part of the aria in an unusual and imaginative way. Virtually unaccompanied outbursts from the soprano (“sempre il cuorsaria,” “Stella barbare,” and “stella spietate!”) alternate with rapid flourishes on the piano, creating an atmosphere of expectancy that allows for the most startling change in rhythm. The ensuing Allegretto is a serial rondo (ABACADA Coda). In the coda, Mozart produces the opposite of the effect he achieved in the transition when sixteenth-note scale passages in the soprano slow to eighth and then to half notes.